Just moments ago, California Governor Jerry Brown signed into effect SB1298, effectively paving the way for driverless cars in California. For a state that relies more heavily on cars than any other, this is hugely significant when it comes to traffic and road congestion. "Today we're looking at science-fiction becoming tomorrow's reality," said the governor. And tomorrow isn't that far off. According to Google's Sergey Brin, "You can count on one hand the number of years until ordinary people can experience this." More and more Google employees will be beta-testing it starting this year, and when you hear the potential advantages, you'll start to wish you worked there. 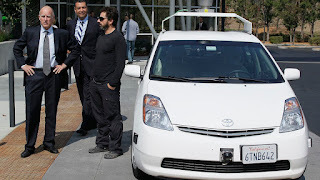 Brin envisions the driverless-cars serving people who couldn't drive under normal circumstances. "There are many, many people who are underserved by our transportation today," he said. "The blind... some people are too young, some people are too old, sometimes we're too intoxicated." But beyond opening the doors to people who might otherwise be cut off from transportation, it's something the masses may quickly get spoiled by. "Why does the congestion happen to begin with? The fact is that on a normally operating highway, cars take up a very small fraction of the space. Mostly it's just air between you the the car in front of you, to the sides of you, and so forth. Self-driving cars can actually 'chain together' and use the highways more efficiently, potentially eradicating congestion." It's hard not to have a visceral, gut-clinching reaction when you picture a string of cars speeding down the highway like cyclists drafting each other in a race. 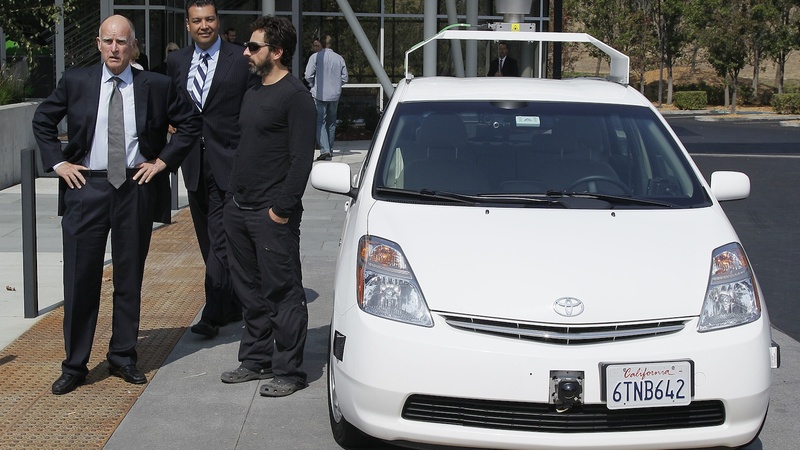 But then driverless cars aren't designed to speed, and according to Brin, "Driverless cars don't run red lights." That's a bold statement, but there would be a lot fewer auto fatalities if it's true. Google's engineering team is busy trying to account for every anomaly. The cars could make us more productive, allowing us to get some work done while we're stuck in traffic. They could also potentially solve a lot of our parking problems. A driverless car could theoretically drop you off and then go find a efficient place to park itself. Or, if you didn't need have to own your car, it could drop you off, then be used by someone else, eliminating the need for parking all together. By Brin's admission, the list of technical details yet to be solved make for a very long list, but Google's driverless cars have already traveled over 300,000 of miles without incident. With the passage of SB1298 today, the door is now open to increasing the amount of road-testing by a significant margin, which will make these cars available to everyone much sooner. We can't wait for that day.